Cebu, Philippines: It's all sunny here! We were just four friends when we went there three years ago, but my memories of Cebu will linger on in my thoughts forever. Our vacation was short, but sweet. 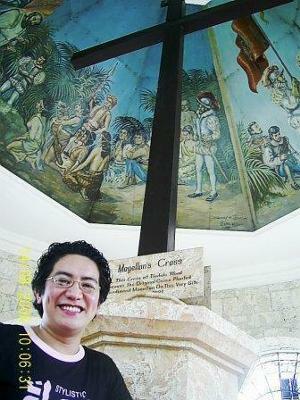 Though, we didn't get to go on beaching and clubbing in Cebu, my trip to the Magellan's Cross made it all so sweet. Aside from the usual, it is the Cross that I wanted to see amongst all the destinations. We also went to the SM City Cebu, Lapu-lapu/ Mactan Shrine, Guitar Master store, Taoist Temple, La Cueva de Nuestra Señora de Guadalupe- Langob Shrine (Guadalupe Cave), Sto. Niño Cathedral, Fort San Pedro, and National Museum for Region VII. Join in and write your own page! It's easy to do. How? Simply click here to return to Cebu.